Teaching & Projects Abroad becomes Projects Abroad! This month, the UK’s leading Gap Year company ‘Teaching & Projects Abroad’ changes its name and becomes known simply as ‘Projects Abroad’. The change for the West Sussex-based organisation comes after 15 years of arranging worthwhile voluntary placements – designed to be of benefit to both the volunteers and local communities, for over 15,000 people from the UK, US and elsewhere in Europe. Head of Recruitment, Ian Birbeck, says; "we now have hundreds of different projects in a vast range of areas, we wanted our name to reflect the diversity of projects and range of opportunities on offer. Everything else will remain the same." Projects Abroad projects are developed to work with local communities and volunteers participate on individual placements, rather than going overseas as one big group. One of the main aims of the programme is to foster cultural understanding between the host countries and western volunteers – so breaking down stereotypes and international barriers. In the 15 years it has been running, Projects Abroad and Projects Abroad volunteers have made regular donations to the schools, care centres, hospitals and other organisations with which they work. Projects Abroad also directly employs 200 staff in destination countries to look after the volunteers, match the needs of the volunteers to the communities and ensure continuity of the projects. Ian comments, "Last year, Projects Abroad organised more than 3,000 voluntary placements in less developed countries, channelling more than £2 million into host economies". "The volunteers provide welcome helping hands on the building site enabling the projects to reach completion… but the projects would not be possible in the first place without the money coming from volunteers' fees through Projects Abroad. These not only help to supply tools and materials to the building site but extend beyond the building site into the communities we are placed in." "It is more than the material and financial gains of taking volunteers into a community that have the most profound effects, it is a subtler cultural exchange that takes place. For so many Ghanaians that I met in the Akuapem Hills where I lived the simple knowledge that people from the 'white world', who in their eyes are rich beyond their wildest dreams, actually want to visit and support their community is more valuable than all the mud bricks we could ever make." Set up in 1992, Projects Abroad specialises in offering Gap Year and university students a diverse range of projects and destinations throughout Asia, Africa, Eastern Europe and Latin America. Projects Abroad offers 80 different placements in areas such as sport, medicine, teaching, conservation, journalism, business and community development. 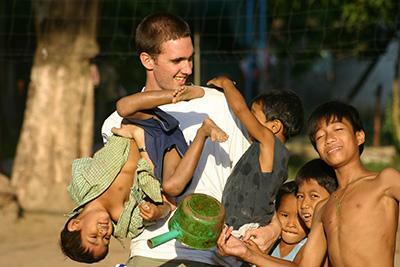 Photograph shows Alan Flood, who did a teaching placement at the Lighthouse Care centre in Cambodia. Photographs, interviews and case studies are all available upon request.